Due to popular demand (like two people asked), I am going to begin sharing why I don't use the library. It is a bit unusual for someone who loves books as much as I do. dear library, it's not you, it's me. When I had a library card I was extremely talented at losing that as well. Over. And Over. The library was somewhat gracious the first time. Then they wanted to charge me a replacement fee for future cards. How many replacement fees would I have to pay? And friends, not just for library cards. Because if I lose library cards, I can also lose books. And have to pay replacement fees for those as well. That's a little more expensive. I didn't ask why you didn't use the library but I did wonder. I don't use the library either and it's because most of the time our local library doesn't have the book I'm looking for so I've given up even checking the library. So, what's the alternative? Do you have a good used book store in your town? Do you buy off eBay, or do you shell out the cash for new books? I can't justify the cost of new books, but I'm also frustrated with my library system not having books (even when the computer catalog says it's in). I'm trying to ask around to see what I can find in used books. 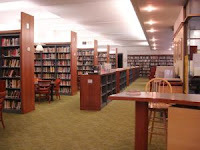 You know by all my posts that I am a library groupie. :) However, I understand the library isn't for everyone. And if I didn't have the personality I did, I would have told the library to bite me long ago. Sarah! Check out my post on my favorite ways to find cheap books. Admittedly for me it's a bit easier because I read across a wide range of genres. Also, I will shell out the cash for new books of author I love in order to support them. Do you have a good thrift store in town? I understand this. I'm facing gigantic fees and 3 different libraries right now. I just can't remember to return the books (even after the nice email reminders). Ricardo..I didn't know they had those now! I love those keychain cards. Ricado...true. I wouldn't want my debit card on my keychain, but the library card! I use those for Hallmark and CVS. I am one that uses my library as much as possible but then my family tells me that I am more than a little uptight...LOL. However, I had a friend who had books that were so late she could have owned them cheaper so I understand what you are saying. It's not for everyone. Thanks for explaining. I was really curious. I have paid my share of late fees to the library. And yes it is embarrassing, annoying and frustrating, BUT I have to say that I look at it as a charitable donation. Now please don't flame me, because I know that it really isn't a charitable donation. I just feel like it is my way to support such a wonderful system. I'm way to cheap to buy books, plus I don't have space in my house for them.